ANAHEIM and LOS ANGELES, Calif. — Anaheim Mayor Tom Tait and Los Angeles Mayor Eric Garcetti agreed to a friendly wager — an exchange of community service projects — as the Anaheim Ducks and Los Angeles Kings begin the best of seven series in the Second Round of the NHL Western Conference Playoffs tomorrow in Anaheim. This is the first time the two teams will face each other in a playoff scenario. If the Ducks win the series, Mayor Garcetti will join Mayor Tait in visiting Anaheim’s Guinn Elementary School and offer a lesson in music and music appreciation. 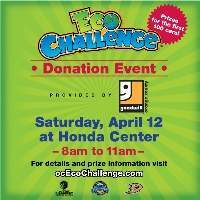 The County of Orange—OC Waste & Recycling, in collaboration with the Anaheim Ducks, is sponsoring an Eco Challenge Day on Saturday, February 1st, from 8 a.m. to 11 a.m. in the parking lot of the Honda Center, 2695 E Katella Ave, Anaheim, CA 92806.